Secure to moderately vulnerable; population may be declining. Considered a “Medium Priority” Species of Greatest Conservation Need in the Vermont Wildlife Action Plan. Follow forestry Best Management Practices around breeding pools to help sustain viable populations. Most of the eastern United States (except Florida) and adjacent southern Canada; west to eastern Iowa and eastern Texas. See species distribution in Vermont here. Spotted Salamanders are the quiet celebrities of vernal pools. Loudly marked, and fixed with what seems to be a perpetual smile, the Spotted Salamander has slimy starpower, the vernal pool's equivalent of a Giant Panda. Spotted Salamanders also have fascinating life histories – essentially spending the year underground and emerging during spring rains for a once-a-year breeding session. Beyond that, Spotted Salamanders are among our best indicators of healthy vernal pool/woodland ecosystems. VCE’s work with Spotted Salamanders comes in the course of our projects to map and monitor vernal pools – forested wetlands with a specialized suite of invertebrates and amphibians. Spring Peeper, Wood Frog, Jefferson Salamander, Fingernail Clams, and Fairy Shrimp are among other vernal pool species. Spotted Salamanders will also be part of our work sampling mercury levels in vernal pools. These pools and their distinctive wildlife are at risk. Threats include timber harvesting, which if it doesn’t ruin the pool itself can reduce the “canopy closure” necessary for Spotted Salamanders and other amphibians that rely on vernal pools for breeding. Adult and dispersing juvenile Spotted Salamanders tend to avoid open canopy forested habitats. Vehicles pose another threat. During spring rains, Spotted Salamaders emerge from their underground habitats and walk through forests to vernal pool breeding sites. They often cross roads on the way. These “salamander crossings” can become killing fields. As a result, on nights during mass salamander movement, volunteers deploy as “crossing guards” so that Spotted Salamanders and other amphibians can safely reach their venal pools for breeding. An essential element to protecting the forested life zone on which these salamanders depend is understanding the distance and direction individuals move, or emigrate, from vernal pools after the spring breeding season. Moreover, after they leave the pools, do these two salamander species prefer specific micro-habitat locations when they “go underground?” This was the focus of research by VCE Conservation Biologist Steve Faccio, which was published in the Journal of Herpetology. Yet following around a subterranean salamander is anything but easy. So Faccio employed radio telemetry to track the animals’ movements around two breeding pools at the Marsh-Billings-Rockefeller National Historical Park in Woodstock, Vermont. After their spring breeding season, he captured 16 adult salamanders (8 Spotted and 8 Jefferson salamanders) and fit each with a tiny radio transmitter. With each transmitter broadcasting at a unique frequency, Faccio would be able to identify individual salamanders and track their movements. He returned his 16 research subjects to their point of capture and began to monitor their whereabouts. Various other studies have identified the habitat features that provide salamanders with the necessary forest floor microclimate and subterranean refuges. These include deep, uncompacted leaf litter; coarse woody debris; stumps and roots; dense understory vegetation; a closed forest canopy; and presence of small-mammal runways. Yet small-scale habitat disturbances that affect the forest floor environment, including logging, can damage these micro-habitats and threaten local salamander populations. Many state and federal guidelines, designed to minimize ecological impacts, may be inadequate to conserve amphibian populations. Faccio‟s research offers critical new insights on the habitat requirements of Spotted Salamander and one of its relatives, Jefferson Salamander. Faccio was able to track the salamanders between May 17 and November 15 of a single field season. So how far did they move in this period? In some cases, much farther than earlier research had reported. For both species combined, salamanders moved an average of 112 meters from their release points. Most emigrated from pools during overnight rains, but the timing, direction and distance traveled varied widely among individuals (from as close as 11 meters to as far as 405 meters). On average, Jefferson Salamanders in the study went farther (123 meters) from their vernal pools than did Spotted Salamanders (101 meters), and females moved nearly twice as far (155 meters) as males (78 meters). This latter result may have important conservation implications if buffer zones around vernal pools are not large enough to include females. Habitat loss that disproportionately affects females could increase the risks of local extinctions. By combining his results with data from other studies, Faccio determined that salamanders use an area extending 175 meters from a vernal pool‟s edge. 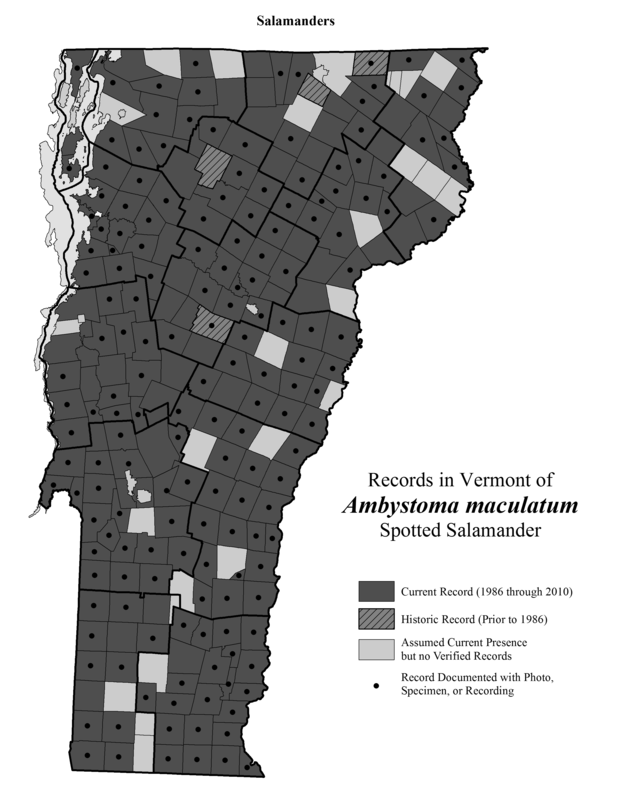 This salamander “life zone,” as Faccio defines it, would include not only salamanders emigrating an average distance (112 meters in this case) but also salamanders that venture even farther away. Overall this zone can be expected to include 95 percent of the population breeding in a given vernal pool. The 175-meter life zone would encompass roughly 10 hectares (25 acres) of forested habitat. In addition to documenting the distance that salamanders travel from a vernal pool, Faccio identified their habitat preferences. In general, Jefferson and Spotted salamanders preferred well-shaded, deciduous forest stands with abundant logs, stumps, and other coarse woody debris. There, unable to excavate their own tunnels, they almost exclusively used two types of small-mammal burrows as their terrestrial refuges: deep vertical tunnels and highly branched horizontal tunnels. This finding suggests that an important ecological relationship exists between mole salamanders and small mammals that excavate and/or maintain tunnel systems. Populations of these small-mammal species may be key to maintaining viable salamander populations by providing both summer and winter refuges. In areas with few small-mammal burrows, it is possible that competition between salamanders could limit their population densities. Faccio‟s most noteworthy conclusion is that the forested areas surrounding vernal pools need greater protection than they currently receive. Many states adopt “Best Management Practices” for forestry operations. These BMPs, for example, typically recommend small buffer zones ranging from 15 to 30 meters in which logging around vernal pools is limited. These small buffer zones are designed to protect water quality and maintain proper forest floor conditions immediately surrounding a pool, but in most cases they fall well short of the 175-meter radius suggested in this study.